The US 97 Corridor between Bend and Klamath Falls, Oregon, has high mortality rates for wildlife due to frequent vehicle/animal collisions. These collisions particularly affect the State’s mule deer population, which make their spring and fall migrations perpendicular to the highway. Along with their impacts on wildlife populations, vehicle/animal collisions also present dangers for humans and often result in vehicle and property damage. In recent years, the number of collisions has grown due to increased traffic volume on US 97 and the addition of new travel lanes. Photo credit: ODOT. Figure 2. 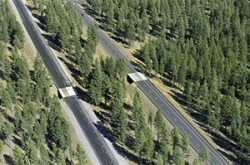 The project developed wildlife-only passage structures for both the northbound and southbound corridors. In 2004, the Oregon Department of Transportation (ODOT) began developing the US 97: Lava Butte – South Century Drive project. The project, completed in 2011, increases both the capacity and safety of US 97 for nearly four miles along the corridor by transforming the existing two- and three-lane highway into a four-lane, divided rural expressway and addressing key wildlife issues, including vehicle/animal collisions, wildlife mobility, and habitat connectivity. As part of the project, an interagency team, including ODOT, U.S. Forest Service, Oregon Department of Fish and Wildlife (ODFW), and the Federal Highway Administration, worked together to design two wildlife passage undercrossing structures. Both wildlife passages accommodate wildlife use, and one supports both vehicle and wildlife crossings along a low-volume access road. The project’s design incorporates many different elements, including treatments of logs, placement of vegetation and rocks in the crossings to support small mammal use, four miles of exclusionary fencing to limit wildlife crossings at undesired areas, four wildlife escape ramps, and six ElectroBraid™ mats to prevent wildlife from entering the roadway. 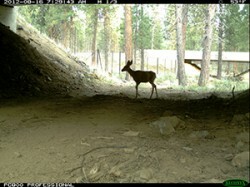 The US 97 wildlife passage project is ODOT’s first project that supports large-scale wildlife passage structures. The undercrossings developed as part of this project will encourage safe travel for both wildlife and humans along the US 97 corridor and help to strengthen habitat connectivity. With such passages in place, ODOT anticipates that the area’s mule deer herd will be able to migrate more easily and safely, helping to support both the herd’s population and provide better connections to other habitats. Today, a multi-agency technical advisory team, including representatives from ODOT, ODFW, and Portland State University, monitors the corridor and measures wildlife use at the undercrossings to evaluate effectiveness and support future research. For more information, contact Randall K. Davis, Oregon Department of Transportation, at Randall.K.Davis@odot.state.or.us.